Advanced SystemCare Free 7.3.0.459 download software for Windows 7, Win2000, Windows 8, Vista, Win XP. 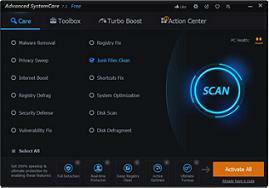 Advanced SystemCare 7 Free takes a one-click approach to protect, repair, clean, and optimize your PC. With over 150 million downloads worldwide, this fantastic, award-winning, free PC repair software is a “must-have” tool for your computer. It’s easy to use and 100% safe with no adware, spyware, or viruses. Security Reinforce – Added this brand-new feature to reinforce the security of system weakness to avoid hacker’s invading, especially for Windows XP. Support Windows XP Permanently – Advanced SystemCare will continue support Windows XP to ensure Windows XP’s security and performance. PCtransfer – Added PCtransfer in Toolbox, the best free and portable data transfer assistant. IObit Uninstaller – Updated to IObit Uninstaller 3.2, which supports the detection of apps installed from Chrome Web Store and accelerates Powerful Scan. Vulnerability Fix – Supported the update of Windows XP’s already known security holes to maximally ensure Windows XP’s security. Homepage Protection – Strengthened the protection feature and made the UI more user friendly. Latest Browsers – Homepage Protection, Surfing Protection & Internet Booster support Firefox 28, Chrome 34. Privacy Sweep – Added support for Chrome 34, Firefox 28,Opera 20, KMplayer 3.8, Auslogics Disk Defrag 4.5, Malwarebytes Anti-Malware 2.0, ZoneAlarm Free 13.0, Firefox 28.0, Adobe Air 13.0, Flash Player 13.0.